There are artists who are the real deal, and who are ‘great’ for one reason or another; there are artists who become superstars and fade, and there are those who become legendary and remain fixed forever in the firmament. 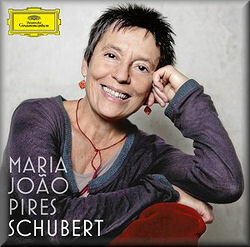 Maria João Pires is already something of a superstar, and while she seems to have been around forever each new release seems to elevate her ever up that scale of greatness. As soon as you hear the opening of the Piano Sonata A minor D 845 you know this is the real deal, and that something special is happening. Pires’s opening Moderato is measured, but things are already occurring which make you listen to the music with new ears. There is an intensity in the dynamics and in those repeated notes both in the inner lines and the melody which create something fresh; which makes one listen as if for the first time. Pires gives this movement symphonic scale, moving with monumental stability of tempo through Schubert’s massive and powerful statements, as well as moments of repose which are like sleeping beasts and passages of lyrical tenderness which turn the very furniture around us into malleable putty. Each cycle and repeat is filled with subtle variation; the drama unraveling is pure music which is entirely gripping and satisfying, but which seems to resist flowery extra-musical associations. By the end of just this one movement you wonder how Schubert is going to follow such a magnificent masterpiece, and perhaps in this way we also understand why in some cases he never did. After the vast conclusion of that Moderato there is only one way to go, and Pires is alert to the pared-down simplicity with which the Andante opens. This movement is however destined to be on as grand a scale as the first, and we are taken on a journey through Viennese ballrooms, and then into chambers of the darkest tragedy… It’s like the camera panning between scenes in The Cook, The Thief, His Wife & Her Lover, with vivid colour and contrast defining the different spaces and their individual moods. Pires as we know is a consummate performer of Mozart, and you can sense her feeling this music as standing on the shoulders of this giant, but taking his technical advancement into ever further and distant worlds. It’s no wonder audiences and players found these kinds of works too difficult in Schubert’s lifetime. They’re still pretty demanding even now, especially with someone like Maria João Pires able to reveal layers of magnificence at times only hinted at before. Talking of new-ness, had you ever before quite realized how completely mad the Scherzo is in this sonata? If you love your Bruckner you will find yourself entirely immersed and involved in this strange and angular series of fanfares and calls and stops and outbursts. Then at 4:21 the new central section takes us somewhere completely different, the softness of Pires’s touch creating a genuinely magical atmosphere. The final Rondo is Schubert’s tease, romping us home with little call-backs and suggested references which look both forward and backward, so you could swear he was at times being as Caprice-ious as Paganini. Comparing Pires with someone like Radu Lupu shows where the Mozart-up approach has its strengths since, where Lupu’s playing is poetic and fiery and perhaps more overtly impressive, his more romantic colour ultimately has a more unifying effect, and I find I’m missing so many of the new details I’d been picking up from Pires. Paul Lewis is another name to be reckoned with, and his D 845 is breathtaking indeed. I wouldn’t want to be without his performance, but that sense of discovery with Pires is irresistible. Lewis’s Scherzo for instance is a good two and half minutes shorter than Pires’s but I find the eccentricity of Schubert more apparent with the latter. There is room for both approaches, but Lewis’s is a lightening Tom & Jerry escapade to Pires’s Brucknerian psychological edifice, and the relative forward momentum of her final Rondo wins as a result, with Lewis’s being rather ‘more of the same’ than an entirely new and wittily refreshing experience. So to the Holy Grail which is the Piano Sonata in B flat major, D 960. If like me you have a kind of unattainable ideal of this piece in your mind then any recording is going to find it hard if not impossible to meet such exacting demands. What Pires has with that opening Molto moderato is the perfect atmosphere – a fairly leisurely pace but with lyrical shape, and a depth of detail which once again is a newly-minted experience. She is unafraid of those repeated notes which drive the inner workings of the music like a motor, and brings out the stresses and dramas without excess. It is here that her quote in the booklet is most telling, “…one can have a tendency to take hold of the piece and interpret… Or, on the contrary, one can also not take hold of it at all but quite simply meet it as it is.” This approach is one which hopefully brings us closest to the composer as artist rather than the performer, and we are gripped by Schubert as much as we are by the clarity with which Pires communicates his musical message. I will probably never hear my ‘perfect’ D 960, but the journey towards finding it is made all the more pleasurable through sublime performances such as this one. If I was coming to this piece for the first time through this performance or introducing it to someone, then I would be happy to take Pires’s recording as a standard bearer. Her performance is not dissimilar in timings and quality to that of Rian de Waal (see review), though she does something remarkable with the second Andante sostenuto movement, resisting the temptation to carry all of the notes through with pedal in the opening bars and further on. These spread harmonic notes are in this way given their own melodic function, and once again a revelatory aspect of the music unfolds before our ears. Her playing here creates exactly that kind of world-stops-turning timelessness and sense of eternity which this listener seeks, and I treasure it warmly. The change in character later on in this movement is also entirely in proportion, and we are elevated onto higher planes rather than bumped into a different gear. One of the features I liked about Rian de Waal’s performance was the way he managed to be inclusive of the latter movements in this sonata. Pires doesn’t give undue weight to Schubert’s lighter moments, but similarly imbues them with wit and expressive content. There are moments in the Scherzo which to me feel like skating on a perfectly smooth surface, while shapes and different lights and colours pass vividly beneath your feet. It’s a kind of weightless dance which can be quite vertigo inducing. The final Allegro ma non troppo is that jaunty journey home, but one in which the obstacles are of course the most interesting parts. The occasional blackened and nightmarish tree looms over our path, but Pires/Schubert keeps our spirits up and we overcome; heroes and heroines all. My goodness – I’m not sure if at 83:24 this isn’t the longest CD in my collection, but there can be no complaints about the duration. As you may have gathered, I am very enthusiastic about this recording. Pires makes her anti-interpretation standpoint clear and manages to create performances which are uniquely communicative and fresh, keeping the ageing ears of this listener agape and agog from beginning to end. Deutsche Grammophon’s piano sound is very good and the acoustic is balanced perfectly, creating sufficient resonance without obscuring detail in any way. If you want to enhance your life with as ‘perfect’ a Schubert piano disc as can be recommended, then let this be your Elysian Field.